1920’s Collaroy Fishing Village and Long Reef Fishing Club. 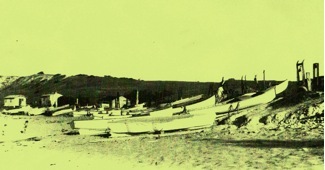 Long Reef Fishing Club – possibly Sydney’s oldest registered club, 1871. In the late 20’s, I used to fossick round the reef and catch lobster with a wire ring, horse tail hair, Cungivoi or Perry Winkles for bait. We would hang around the beach boats when they came in hoping to be given a fish. I can only remember a couple of fishermen – Charlie Proud Foot and Clarrie Hill. I started fishing when I was about twelve with Jock Brown who had built his own boat, a double ender and wasn’t it cranky. He had to put a bag full of sand in it to keep it upright. The first time I went out I got as sick as a dog and threatened to swim in. I kept going and eventually overcame it. In these early days Jack Tennant, Clarrie Hill & Phillo Martin had huts on the beach. Jack would always have a cup of tea and a biscuit for you if you went along for a talk. Phillo sold a bit of bait and Clarrie had Cray pots. We learnt a lot of fishing ethics from them. Later when I had to go to work. I didn’t go so often but always had a plan to get a Beach Boat. After five odd years in the A.I.F. I, with Bob Maladay and Alan (Kooka) Scown bought a twelve foot yacht’s tender with a 3 h.p. inboard Penguin Motor. We left it on the beach. It was a good craft but a bit small if all three of us wanted to go out. We persevered for a while and then had a fourteen foot Fisher from Putney built with a 6 h.p. Clay Motor. We fished often but, couldn’t get onto the Jewys, Bob Gee came to our rescue and told us to drop your bait to the bottom then lift it three foot – tie it to your cane rod and they will catch them selves – wacko! He was right – 1980’s photo of Bill Abbott, Bob Maladay Joe Campbell and Alan (Kooka) Scown. Note: Long Reef Aquatic Reserve now declared as a “No collecting” area – marine plants and animals protected and the collecting of bait prohibited. The Fishing Village has recently been nominated as a Heritage – listed site. The remaining Club Hut is already listed as a Warringah Heritage building.